The body of the series Pura blue-silver is made of high-quality aluminum. By combining shiny and frosted surfaces, an interesting contrast between bright silver and classic blue has been created. The strong but flexible silver clip on the cap underlines the classic line in an elegant way. 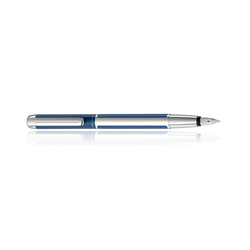 The fountain pen Pura blue-silver works with a practical cartridge refill system, and the polished stainless steel nib is available in different nib sizes.